We have recently expanded the maximum number of post-HRA automated emails you can send via the portal from 3 to 10. The feature is in beta and provided at no additional charge at this time. More automated emails can allow you greater control over the messages people receive and when they receive them. It doesn’t require additional marketing automation software or CRM to execute. You can do more outreach with fewer workflows. Of course, not every HRA user requires this much follow-up. 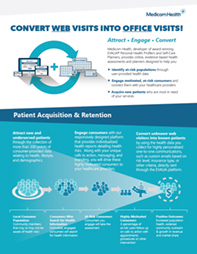 However, this option gives you greater flexibility crafting digital patient journeys. For example, High-Risk participants without a PCP, may be more likely to visit a clinic if they receive additional emails in quick succession. On the other hand, if someone is already engaged with a provider and not at an immediate risk, then fewer and further spaced messages may be appropriate. You can drip out almost year’s worth of content if you want to. It’s up to you. Contact your Strategic Client Partner for messaging suggestions. Our goal is to consistenly provide clients with the most revolutionary technologically advanced tools to streamline workflows and ultimately increase ROI.